Happy Friday, y’all! I hope everyone is pumped for the weekend, especially since it’s Halloweekend. I don’t have any super exciting plans but it’ll be nice to just relax before my crazy week next week. 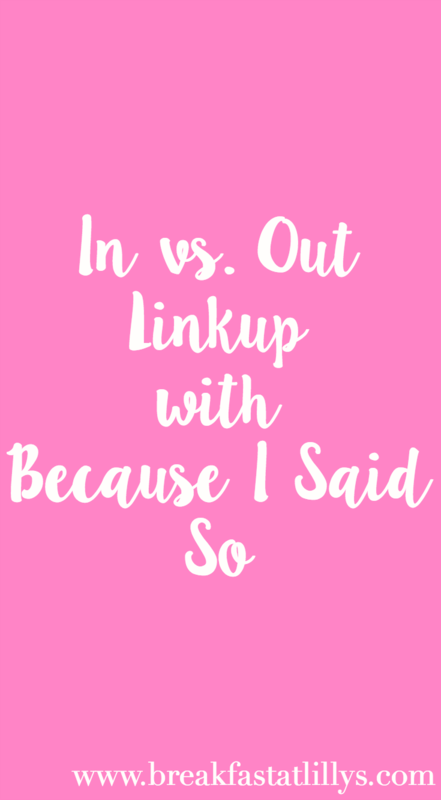 It’s time to link up again with Allison from Because I Said So and discuss the ins and outs of this month. Being productive // I feel so much better when I am super busy and productive. I love how accomplished I feel at the end of each and every day. Weekends // Because when are they not “in”? My only wish is that there was an extra day between Saturday and Sunday. My fall TV lineup // My fall TV schedule keeps me sane. I like to take a break from homework and blogging each night to catch up on one of my TV shows. Waking up early // This will always be a no for me. I don’t think I will ever be a morning person but that’s okay. Traffic // I am officially over sitting in traffic every afternoon. The other day it took me an hour and a half to get home from work. I was not feeling it at ALL. Jealous of all the people who have a 30 minute or less commute each day. My messy apartment // I definitely have been putting cleaning on the back burner lately and only finding time to straighten up on the weekends..and then having it get messy again by Wednesday. I need to find some sort of cleaning schedule so I don’t have to spend my weekends cleaning up. What are your ins and outs for October? Let me know down in the comments.